Aorta is the largest blood vessel in the body which originates directly from the heart. It carries all the body’s circulating blood volume at the time it leaves the left ventricle. When the aorta wall is compromised it can lead to aortic catastrophes that can kill the person in a single heartbeat. Patients with aortic diseases needs to be careful as their aorta are very fragile. Aortic catastrophe can result in instantaneous and irreversible cardiovascular collapse and thus it is considered as a major risk. Aortic aneurysm and aortic catastrophe goes hand in hand. Generally the aorta blows open and spills out the complete blood volume from your body in a matter of few seconds that can lead to sudden death. In initial stages aneurysm patients show symptoms like tearing and leaking of aorta. This kind of condition is more common and can be considered as a sign of increasing risk of aortic catastrophes. Cigarette smoking and other forms of tobacco can also increase the risk of aneurysm by damaging the aorta and making the aorta walls weak. Atherosclerosis is a condition when the fat and other substances get accumulated in the lining of blood vessels. This kind of accumulation results in aneurysm. High blood pressure generally causes damage to the aorta wall and makes it weaker and can lead to aortic aneurysm. The diseases that can inflame the blood vessels can result in aortic aneurysm. Bacterial or fungal infection in the aorta can lead to aortic aneurysm in rare cases. Sudden accidents or injury also results in aortic aneurysm. People who are above 65 years of age are at high risk of aortic aneurysm. Tobacco intake is a common risk factor for the development of aortic aneurysm. Continuous smoking increases the risk of rupture. The more you smoke or chew tobacco, the more you will be closer to the risk of aortic aneurysm. Men are at high risk of developing aortic aneurysm when compared to women. White people are at high risk of aneurysm when compared to dark skinned people. People with a family history of aortic diseases are at higher risk of developing aortic aneurysm. People with high blood pressure are at increased risk of developing aortic aneurysm. Aortic aneurysm is generally treated by an aortic aneurysm surgery. This surgery is recommended only when your aneurysm is about 1.9-2.2 inches or larger in size. The surgery for aortic aneurysm treatment is also referred to as aortic dissection surgery. The surgeries to treat aortic aneurysm are classified into 2 different categories: open abdominal surgery and endovascular surgery. If you observe any symptoms of aortic aneurysm, then you can consult Dr. Abhilash Sandhyala for aortic dissection treatment. 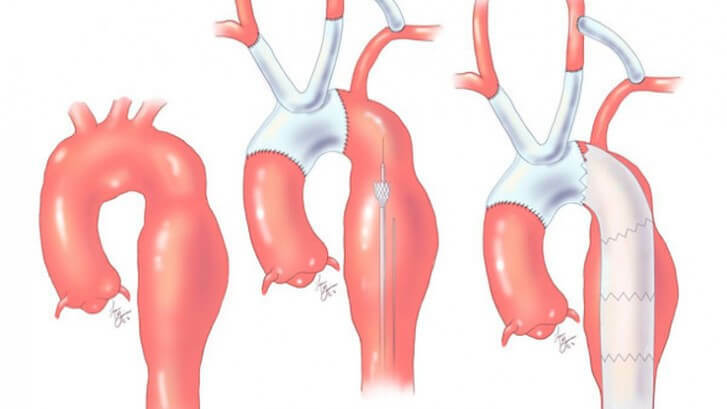 He is an efficient endovascular surgeon in Hyderabad known to perform many successful endovascular surgeries and also treat aortic aneurysm cases.